Due to the huge increase in the number and dimension of available databases, efficient solutions for counting frequent sets are nowadays very important within the Data Mining community. Several sequential and parallel algorithms were proposed, which in many cases exhibit excellent scalability. In this paper we present ParDCI, a distributed and multithreaded algorithm for counting the occurrences of frequent sets within transactional databases. 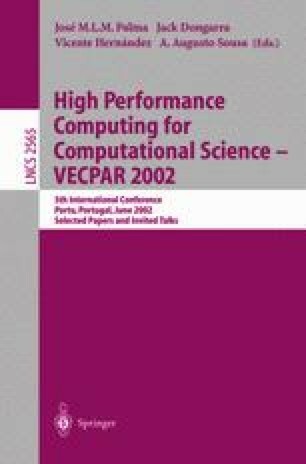 ParDCI is a parallel version of DCI (Direct Count & Intersect), a multi-strategy algorithm which is able to adapt its behavior not only to the features of the specific computing platform (e.g. available memory), but also to the features of the dataset being processed (e.g. sparse or dense datasets). ParDCI enhances previous proposals by exploiting the highly optimized counting and intersection techniques of DCI, and by relying on a multi-level parallelization approachwh ichex plicitly targets clusters of SMPs, an emerging computing platform. We focused our work on the efficient exploitation of the underlying architecture. Intra-Node multithreading effectively exploits the memory hierarchies of each SMP node, while Inter-Node parallelism exploits smart partitioning techniques aimed at reducing communication overheads. In depth experimental evaluations demonstrate that ParDCI reaches nearly optimal performances under a variety of conditions.